Watermelon is a great fruit and a full diet. In particular, it increases your body's blood, and is very useful for the stomach. Half hour before eating melon is extremely useful. Keeping the same feature we've configured this recipe. And it is not only easy recipe can be prepared in minutes. Which does not only fill sweet crunch to your table along with add more variety becomes. 1- Cut the 3 melons in half horizontally and scrape out the seeds with a spoon. 2- Working over a plate to catch the juice, scoop out melon balls with a parisienne cutter or melon baller. If you do not possess one of these, a round 2.5 ml / 1/2 tsp measure makes a good substitute tool. Put the melon balls, together with the juice, in a bowl. 3- Spoon out the pulp from the melon shells to extract any remaining juices. Puree the pulp in a blender, then add to the melon balls in the bowl. 4- Cover the bowl with foil and chill the melon for at-least 2 hours. 5- Just before serving, drain the melon balls, reserving the juice. 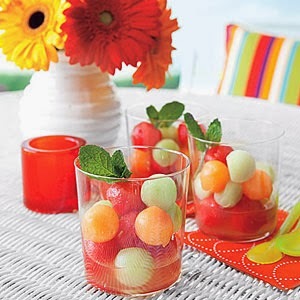 Divide the juice and melon balls equally between 3 serving bowls. 6- Flavor one bowl with ground ginger and toss with chopped walnuts. Flavor another bowl with ground cinnamon and decorate with grated orange zest. Finally, flavor the third bowl with lemon juice tossed with chopped mint. If the melon is not particularly sweet, you may wish to add a sprinkling of caster sugar to each bowl. 7- Chill until right before serving. Guests serve themselves from each of the three bowls.